I can’t imagine summertime without barbecue…ribs, chicken, pulled pork, you name it. When it comes to ribs, I love sticky, sloppy, finger-licking sauces, although I like dry rubs as well. This is a family favorite that we enjoy when we visit Michael’s parents at their camp in the Adirondacks. 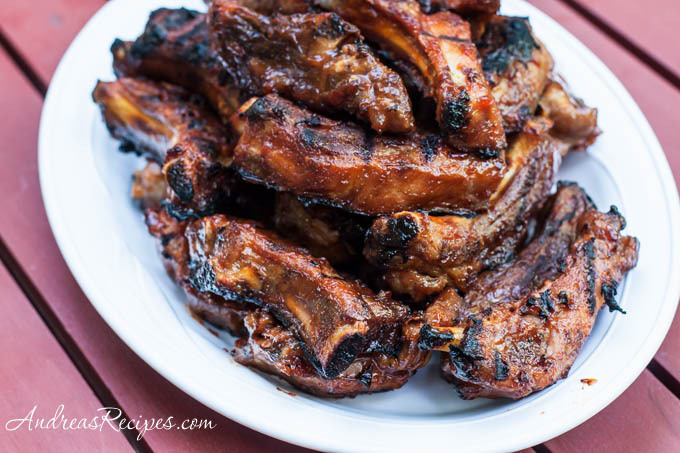 The ribs are great for 4th of July cookouts along with salt potatoes, corn on the cob, and an assortment of side salads. 1. Preheat oven to 350° F/175° C.
2. Line baking sheets with aluminum foil. Cut ribs into serving-size pieces; place the ribs meat side up on the baking sheets. 3. Bake for 1 hour or until meat is tender. Drain and remove from the sheets. 4. Preheat the grill to medium-hot. Combine all the sauce ingredients and stir well. Place the ribs on the hot grill for a couple minutes to get them sizzling. Remove ribs and dip into the sauce; allow excess to drip off and place rib back on the grill. Cook about 10 minutes and repeat. Continue the dipping and grilling process until ribs have cooked for 30 minute. Serve with extra sauce on the side. You can use other ribs with more meat, such as beef ribs or country-style boneless ribs, just increase the baking time to 1-1/4 hours. 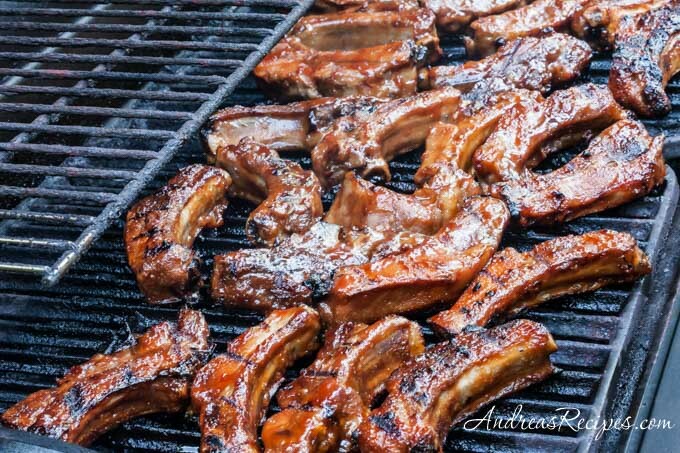 You can bake the ribs ahead of time and keep them in the refrigerator, then do the grilling when you are ready. these look too mouth watering for words! You’re right summer time is all about the BBQ. My in-laws thank you! They really do a great job on these. There weren’t any ribs left after dinner that night. So you grill them already cut? That is a really great idea!! Hi Kimberly! Yes, they cook up quicker that way, you just have to keep an eye on them as they are grilling and turn them frequently.